← What’s the Best Love Story of All Time, Clare? All this week we’ve been giving Darley’s angels a chance to vote for the love story that they think should win the title of Best Love Story of All Time. Camilla, what is the best love story of all time? The question of which is my favourite love story is something that has been tucked into my pocket and carried around all week. There are definitely the greatest love stories of all; Love Story, Romeo & Juliet, The Time Traveller’s Wife to name only a few. Tales where One Great Love smashes through a life leaving everyone dizzy and breathless. But with these stories there is also the greatest sadness. Tragedy is One Great Love’s best friend and as a loveaholic the danger of our addiction is the gut-wrenching catastrophic effect death has on love. So with my Valentine’s heart on my sleeve I’m unable to cope with considering the thought of such sadness. This is why my answer is turning to what I call the Quiet Love Stories. A love not without history, drama or disaster, but it is grown from hope, kindness and a calmness that allows you just to be, together, forever. 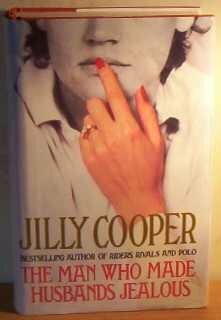 For me a book that has this in every way is Jilly Cooper’s The Man Who Made Husband’s Jealous. It doesn’t have the intensity, plotting or perhaps epic proportions of the great love stories, but it is the Queen and King partnership of Quiet Love and it really touched my heart. support and gentleness neither have ever been allowed before. And it is through these moments of being that a Quiet Love is born. Alongside this wonderful love story is also that of the infamous Rupert Campbell-Black and Taggie O’Hara. All Jilly Cooper fans will have an opinion on ravishing Rupert and in the series he’s a dark character with his demons and danger a plenty. As the series progresses though we have flashes of an unexpected man and our defences are broken down. He is a man of honour and loyalty, yet he’s also a child at heart and someone craving a love that will quietly hold him up until he can believe in himself. Taggie O’Hara is his Quiet Love. A coltish beauty who sufferers from terrible shyness and dyslexia she represents to him everything he isn’t, and it is Rupert recognising this in Taggie that makes him a better man. What do you think? Is The Man Who Made Husbands Jealous the best love story ever told? Did you side with any of the other angels instead? Or perhaps you think we’re all crackers and completely failed to mention the obvious winner? Cast your vote in the comments below. This entry was posted in Interviews, Meet the DA team and tagged Camilla Wray, Jilly Cooper, literary agency, literary agent, literature, love story, The Man Who Made Husbands Jealous, writing. Bookmark the permalink. 1 Response to What’s the Best Love Story of All Time, Camilla? Some great choices here -especially The Time Traveller’s Wife – but my favourites would be ‘Portrait of Jennie’ by Robert Nathan and ‘Somewhere In Time’ by Richard Matheson. Both are romantic fantasies and both left a lasting impression on me. Definitely 3 hankie material!